How big is your mental map of colonial America? A good friend of mine is moving to Los Angeles this weekend. Last night we had a going-away party for him at a local pizza joint. I’ve never been to California myself. The West Coast is about the only major region of the country I have yet to visit. I’ve never really felt much compulsion to go there, especially when it comes to seeing historic sites. As a paleophile, I’d love to see the La Brea Tar Pits and do the original Jurassic Park ride at Universal. (One of my more unrealistic bucket list items is to experience all four Jurassic Park water rides before I die; so far I’ve only hit the one in Florida, which leaves Hollywood, Japan, and Singapore, and I doubt I’ll be going to Singapore in the foreseeable future.) But as a guy who’s into early American history, I think I’ve always had this assumption that there isn’t really anything in California that’s right up my alley, so I haven’t felt the urgency to make it to the West Coast in the same way that I badly wanted to go to New England for many years. Of course, this attitude of mine is based on misconceptions about colonial America. Both California in particular and the West in general have an early American history. It just doesn’t fall within the boundaries of early Anglo-American history. A lot of us get our sense of the basic contours of history from the introductory classes we take in high school and college. And in American history surveys, there tends to be a sort of “progression” toward the English colonial experience. You get your early Iberian explorers, then Columbus, then the conquistadors, then maybe a brief detour up to New Mexico for the Pueblo revolt, then the French, and finally Roanoke and Jamestown, and English-speaking Protestants take center stage from there on out. This “progression” scheme partly has its roots in chronology. The English were relative latecomers in establishing New World colonies, so it makes sense to examine their efforts last. The problem is that we tend to drop the Spanish and French experience altogether once the Englishmen show up. Yet after the English colonies were well established, there were still French fur traders in the Mississippi River Valley, mestizo ranchers in the southwestern deserts, and friars in California. Indeed, in the period between Jamestown and the annexation of California, entire populations rose up in the American West under the rule of Catholic monarchs or the government of Mexico. 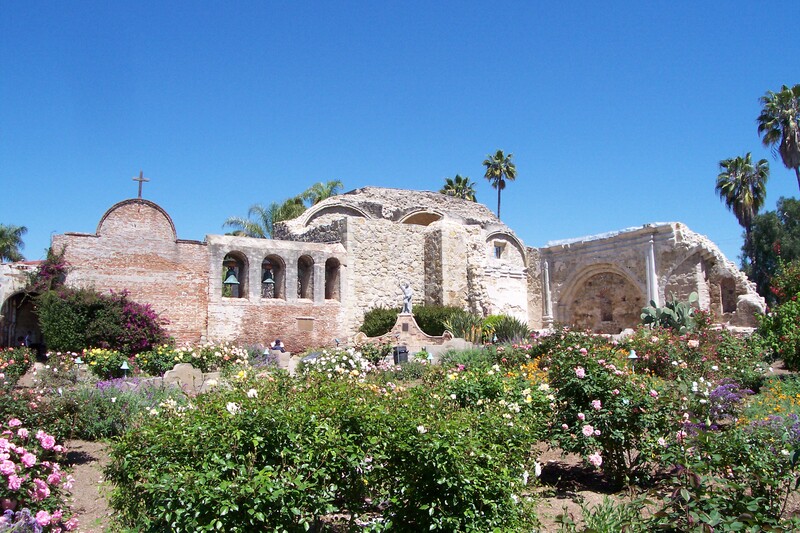 In 1776, while Washington reeled from Howe’s campaign in New York, Spanish Franciscans were celebrating Mass at San Juan Capistrano. And by that time there had been Spanish missions in the Sonoran desert of Arizona for nearly a century. But how many people think of southern Arizona and California as places associated with eighteenth-century American history? I’ll confess that I generally don’t. Instead, we think of the “history” of the Far West as something that started in the 1800s, when settlers of mostly British extraction started pushing back the frontier and displacing the Indians. But the Indians weren’t the only people in the way. The descendants of the original colonists were still there, too, so the contest wasn’t simply two-sided. The Euro-American frontier didn’t just move westward from the English-controlled seaboard, but also southward from French Canada and northward from New Spain. All this was very much a part of early American history, and I’m still trying to get my head around it. The latest issue of Smithsonian has a pretty interesting article on Blackbeard’s last hurrah in colonial North Carolina, with a look at some of the new evidence that’s come to light in the past few years. A 23-year-old Springfield man faces federal criminal charges after he was arrested in the basement of the Lincoln Home early Saturday. Springfield police and National Park Service rangers said Jordan L. Clark, of the 800 block of North Sixth Street, might have been attempting to steal copper wire from the heating and air conditioning system. Damage was estimated at $500 to $1,000. Police say Clark appeared to be under the influence when he threw a brick through the basement window and crawled inside about 1:20 a.m. Saturday. No word on whether the homeowner, a local lawyer and former state representative, was inside the residence at the time. Neighbors do report, however, that he earned a reputation as an amateur wrestler in his youth, and probably could have held his own until police arrived. The Institute for Advanced Study’s plan to build additional faculty housing at the Rev War battlefield has hit a snag. A state regulatory commission has blocked the proposal because of its proximity to a local stream.